We are a friendly, family oriented barn. A place where riders of all ages can learn and thrive. What’s been happening at HGEC! 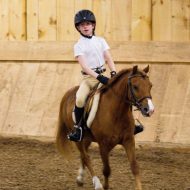 Riding Lessons for all levels of rider. Focusing on safety and building solid riding skills. We teach English style horseback riding in a safe, structured, encouraging and family oriented atmosphere with focus on the positive. Our students are taught how to effectively communicate with their horse. 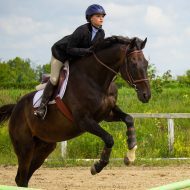 We do not just teach students how to go around the ring on a “push button” horse or pony where the horse or pony knows the routine and the rider is just a passenger. Celebrate your birthday or special occasion with our ponies. Happy horses and ponies! Ample turnout to allow them time to be horses and be a part of the herd. 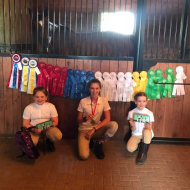 Our riding school students and boarders are welcome to participate in our In House Shows, where the “HGEC family” gets together for a fun day of showing and friendship. These shows are a great opportunity for students to test their skills in a low stress, fun environment. These shows are also great preparation for those students who are planning to show in open shows. our horses and ponies are waiting to meet you!